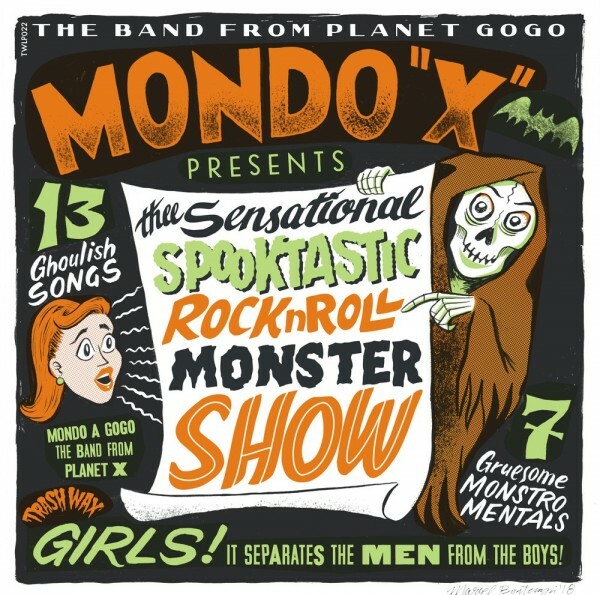 Produktinformationen "MONDO X - Thee Sensational Spooktastic RnR Monster Show LP"
Mondo X play 13 tracks of monster R’n’R, in homage to such notables as Zacherle, The Sonics, Link Wray, Screamin’ Lord Sutch and The Revillos ! They even cover The Tall Boys (Meteors) classic ‘Just Another Half Hour ‘Til Sunrise’. A fine blend of Pop-Punk, Garage Punk, Surf with a nod to 50’s influenced R’n’R which will get even the most zombified up and moving…Tunes to wake the dead indeed ! Features members of The Band From Planet X (Canada) & Mondo a Go Go (Scotland) recorded on Halloween 2017. The fine artwork is by Marcel Bontempi. Weiterführende Links zu "MONDO X - Thee Sensational Spooktastic RnR Monster Show LP"